Nathalie runs a small trekking business in Belgium with her four mules, and when I saw a photo of Tizanes I just had to ask for a Mule Tale. What a cool looking mule! Nathalie says that her other three mules are much easier than Tizanes. 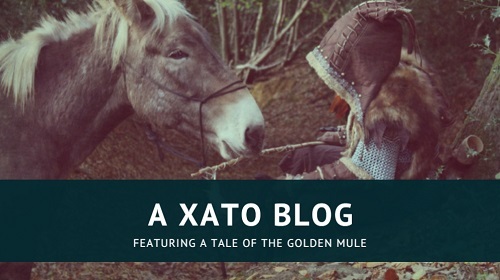 It makes me feel better to know that not everyone’s mules have been hoof-perfect all their lives … but I guess it’s the challenging ones who make us into the muleteers we need to be. All images copyright © Nathalie Leplang. 1. Please introduce us to your mule! 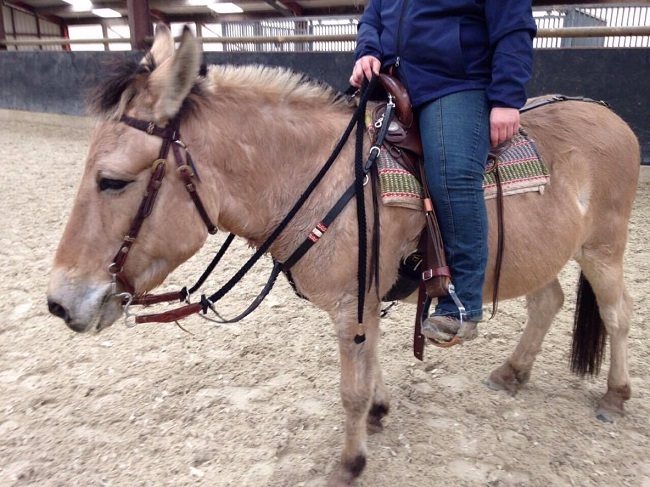 So … this is Tizanes, the oldest of my 4 mules. She is 9 years old and comes from a Fjord mother and Grand Noir du Berry father. She has 1m37 shoulder height [That’s 13.2hh to us Brits! — Sari]. I bought her at the age of 3 and a half in Poitiers, France, about 800 kms from home. Along with her, we bought her half sister Aurore, at that time 1 year old. 2. How did you meet her? And she did!! At the age of 5 she was 1m37 and we started to ride. 3. What do you do with her, and what are your plans for the future? At first everything went very good but after 2 years problems showed. I had fallen down from a friend’s horse and got frightened, and she wasn’t very helpful. She started testing me and became very naughty. After falling off twice it was time to seek help. I sent her for 2 weeks to a retired trick-rider to get her calmed down. That was the best thing I have ever done, she was only 5 days with him when he called to say that I had to come down and ride her. He had put her in another type of mouthpiece and she had made a complete change in attitude – and to this day we still ride with that mouthpiece. From that moment on we went again to our weekly western training. As I have started with guided trail rides with my 4 mules (see my page Hepscheid Longear Trails) we don’t do the training anymore, we now go out in the woods with people who want to ride a mule … so far I ride her myself, but I hope she can be ridden by others also in the near future. Now that we have started the Trails, she likes to come along. I can get her from the fields in no time, can put on a headstall, saddle her without tying her up so we’ve accomplished a lot together. What I would like to accomplish in the future is passing lorries and tractors without problems, and riding out alone. I can ride alone with BamBam, he leaves the herd without going nuts; that’s what I would like to do with her too, have a nice calm small mule along with the 3 bigger ones. 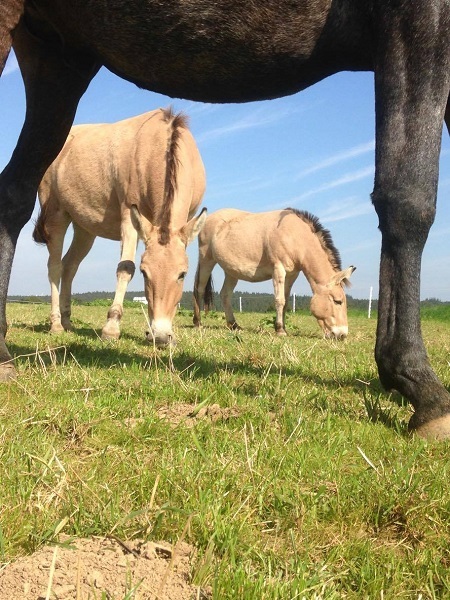 I’ve started with my Mule Trails because I want to share my gorgeous mules with everyone, no horse for me anymore … my longears are much better, smarter, more stable, more emotional, more dedicated, funnier … I can go on. They are much more than any horse I know, couldn’t be without them, I simply love them so much. 4. 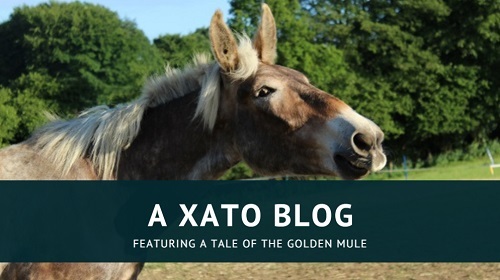 Can you share a story that you feel sums up your mule and/or your relationship with him? I am certain that we have something special … when I first saw her it was like thunder on a clear day. I walked to her and she came to me, something the breeder had not seen before, her walking to a complete stranger … I also bought her without thinking about it, knowing that she wasn’t as big as I wanted her to be. We’ve had some problems before (riding) but still I like her and I like her style, and she keeps on coming to me and no one else. She walks away when our son (22y) walks towards her, and she doesn’t like strangers; my husband, though, is able to touch her and cuddle a tiny bit but I am the only one that can put a bridle on her to go for a ride. 5. What’s the most important thing you’ve learnt as a mule owner, and what piece of advice would you give to someone new to mules? Hahahahaah the other 3 haven’t got such a story as Tizanes, BamBam though was a wild born foal … bought him when he had only seen humans 3 times. It took me almost 6 months to be able to touch him all over his body; I’m so glad he lived with my beautiful Halflinger for 4 months until he suddenly died. I’ve always said that my Halflinger made my baby BamBam so good. Tizanes was the first mule I had to work with. 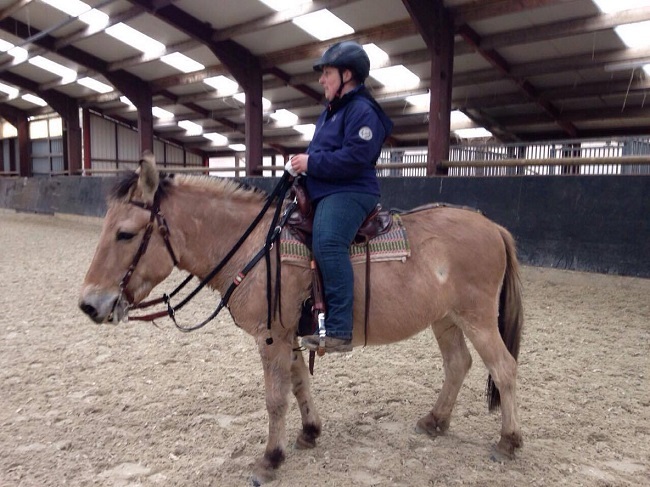 I knew nothing about mules or riding mules, and she has a strong mind … we had to put everything together ourselves, no one could help us as there are very few mules in Belgium. Mules are so different from horses and donkeys. 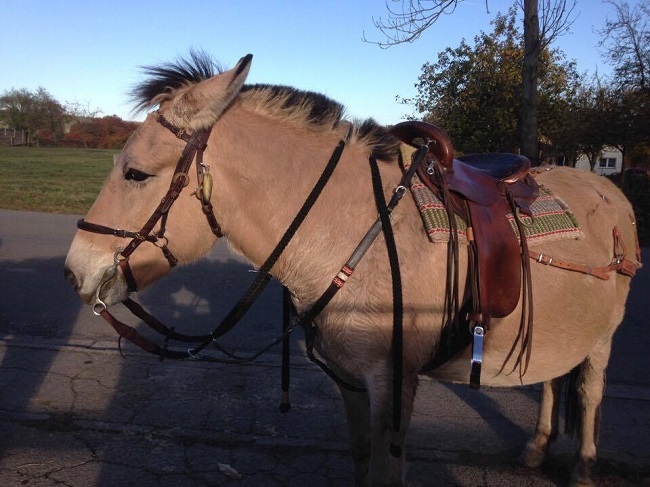 I have owned 2 donkeys for almost 10 years now, but that’s not the same as mules. I have had horses for over 25 years, but mules are different. They have the best of the horse and the best of the donkey in them, of that I’m sure. 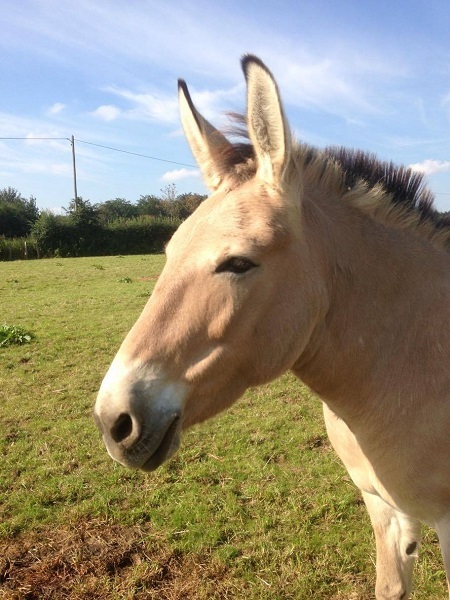 All our mules have pieces from mother horse and father donkey … incredible animals. And advice … hmmmm … never give up? Try at least a few times again, and seek help if something doesn’t work out? Although … we have 4 mules and it’s only this “little monster” that gave a few problems, the other 3 are the easiest mules to work with. If you would like your mule to be featured here, then please contact me either via this blog, message me on my Mulography Facebook page, or email me at: herecirm (at) gmail.com. I would particularly like to hear from UK mule owners (purely because Mulography is about owning a mule in the UK), but am happy to take worldwide submissions! Don’t do that with your foot, Xato. Hello to all!!! I am proud to announce that, we have worked hard these last 3 months, we’ve managed to go towards our girlfriends (Erika and her friesian horse Peggy) for a trip in the woods, we left the herd without problems and arrived both in 1 peace 😄😄 whooohoooooo 😄😎 and 2 weeks ago I had customers for a muleride and 1 of these unbelievable girls rode Tizanes!! Walk,Jog,Lope not a problem at all!!! She was so good and the customers were impressed!!! That’s fantastic to hear! All that hard work is paying off. 🙂 Well done to both of you!